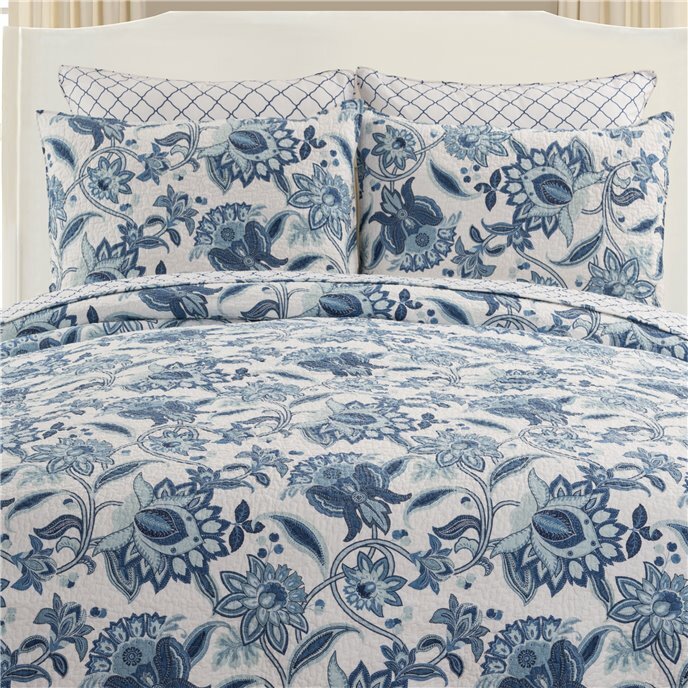 The Julianna bedding collection by C&F Enterprises features a beautiful Jacobean floral print set against a white background. The calming blue colors of the print will bring a sense of serenity to your bedroom. For additional styling options, reverse the quilt to an equally beautiful blue lattice pattern. A rich navy throw pillow will add depth to the bed and coordinates beautifully with the colors of the quilt. The Julianna quilt is 100% cotton and is machine washable for easy care. Made by C&F Enterprises. Beautiful Jacobean florals grace the clean white ground of the Julianna Quilt Set. In a colorway of dreamy blues, you'll find the perfect combination of tradition and tranquility. Reverse to a blue lattice pattern for additional styling options. Crafted of cotton, this bedding set is machine washable for easy care. 1 Twin Quilt and 1 Standard Sham, Measurements: Quilt 64" x 86"; Sham 20" x 26", Hand Guided Vermicelli Stitching, Coordinating Accent Pillows, Euro Shams and Bed Skirt Available Separately, Face 100% Cotton, Fill Material Polyester/Cotton Blend, Machine Wash Cold, Line Dry, Imported. Made by C&F Enterprises. Beautiful Jacobean florals grace the clean white ground of the Julianna Quilt Set. In a colorway of dreamy blues, you'll find the perfect combination of tradition and tranquility. Reverse to a blue lattice pattern for additional styling options. Crafted of cotton, this bedding set is machine washable for easy care. 1 F/Q Quilt and 2 Standard Shams, Measurements: Quilt 90" x 92"; Sham 20" x 26", Hand Guided Vermicelli Stitching, Coordinating Accent Pillows, Euro Shams and Bed Skirt Available Separately, Face 100% Cotton, Fill Material Polyester/Cotton Blend, Machine Wash Cold, Line Dry, Imported. Made by C&F Enterprises. Beautiful Jacobean florals grace the clean white ground of the Julianna Quilt Set. In a colorway of dreamy blues, you'll find the perfect combination of tradition and tranquility. Reverse to a blue lattice pattern for additional styling options. Crafted of cotton, this bedding set is machine washable for easy care. 1 King Quilt and 2 King Shams, Measurements: Quilt 108" x 92"; Sham 20" x 36", Hand Guided Vermicelli Stitching, Coordinating Accent Pillows, Euro Shams and Bed Skirt Available Separately, Face 100% Cotton, Fill Material Polyester/Cotton Blend, Machine Wash Cold, Line Dry, Imported. Made by C&F Enterprises. Navy pillow with tuckstitched detailing. 18" x 18". The Julianna valance features a beautiful Jacobean pattern in a medley of blues on white. 15.5" x 72", including 1.5" header, 2.25" rod pocket. Exceptional value valance has a single layer of fabric. We offer the complete ensemble in the Julianna pattern by C & F.